As Virginians embrace the height of summer with trips into the Blue Ridge Mountains and afternoons spent on trails, most know to check their skin for pesky hangers-on at the end of the day. Peak outdoors season also means peak tick season in this neck of woods. Outdoor enthusiasts have long been aware of the risk of Lyme disease from tick bites, but it’s only in recent years that people have noticed a strange new allergy to red meat that’s also associated with the creature's bites. 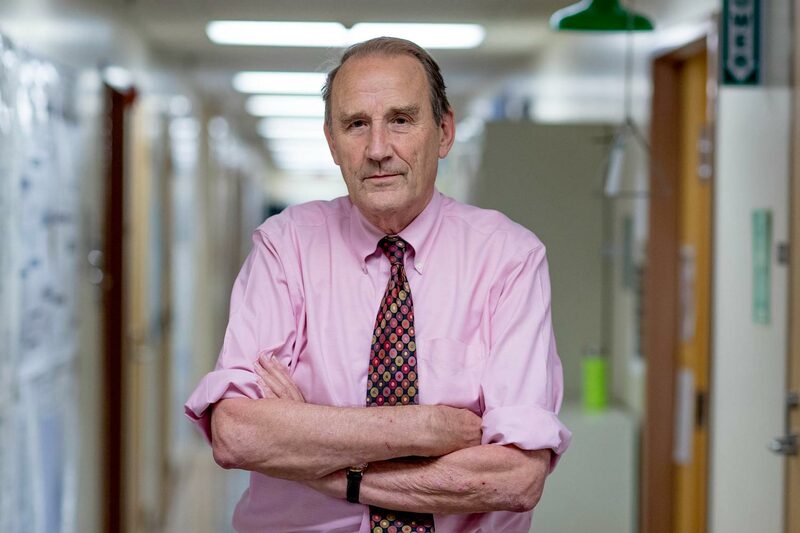 The University of Virginia’s Dr. Thomas Platts-Mills is the nation’s primary researcher on this newly discovered allergy and how its culprit, the Lone Star tick, induces it in humans. Platts-Mills, who heads the UVA Health System’s Division of Allergy and Clinical Immunology, has been researching the steady rise in tick-induced meat allergies for nearly two decades. UVA Today recently sat down with him to learn about the progress of his research and what symptoms readers should be on the lookout for following any tick bites. Q. How did you first uncover the cause of this new meat allergy? A. It all started with the cancer drug cetuximab. The year it was released, it became obvious that some patients were having bad reactions to it in Virginia, North Carolina, Tennessee, Arkansas, southern Missouri and eastern Oklahoma. We had colleagues in clinical trials for the drug reach out asking us to help them figure out why it was causing allergic reactions in some patients in these specific areas. We couldn’t make any sense of that at first, but we did develop an assay [or investigative procedure] that measured immunoglobulin E, or IgE, antibodies to cetuximab. IgE antibodies are the antibodies that give rise to allergy. So if you have hay fever, you will have IgE antibodies to pollen, and if you’re allergic to cats, you have IgE antibodies to a protein that’s present in cat dander. We proved that if you had IgE antibodies to cetuximab before you first took it, you were 30 times more likely to have an allergic reaction to the drug. We also proved what the IgE was binding to. We showed that these patients had IgE to cetuximab but in particular, it was binding to a sugar in the drug called alpha-gal. We found that patients who had antibodies binding to alpha-gal were showing delayed allergic reactions to red meat [meat from mammals]. They got hives or anaphylaxis five or six hours later. Q. How did you make the connection between this allergy and bites from the Lone Star tick? A. My fellow at the time, Jake Hosen, spent two days searching for other ailments that fit the same geographic pattern as the alpha-gal allergy and the only one that matched was Rocky Mountain spotted fever, and we know that is spread by Lone Star ticks. That’s when we started asking patients if they noticed the allergies beginning after they received tick bites. Eventually we found out that patients who reported bites from ticks that itched for more than two weeks were very likely to develop the IgE antibody. Q. Are there any traits that make some people more likely to develop this allergy? A. We’ve thought of lots of possibilities, but haven’t identified specific traits yet. It’s clear that ticks bite some people and not others, but we don’t know why. You can take four people on a picnic in the grass and two of them will get covered in ticks and the other two won’t get any bites at all. We believe that might have something to do with how their skin smells to ticks. Ticks – and, in general, arachnids like spiders, mites and chiggers – are all very sensitive to smell. Ticks smell a mammal and then they jump, but many of them are species-specific. The tick that causes Lyme disease is a mouse tick, primarily. The Lone Star tick is primarily a deer tick and that may be the key to why this allergy has increased so much recently. The deer population has become spiked in recent years. Q. Are there any other known bug or animal bites that can induce allergies this way? A. We know of other ticks that can do this. The Lone Star tick is Amblyomma americanum. In Australia, Ixodes holocyclus does this; in Europe, Ixodes ricinus does this; and we know of varieties in Japan and Africa that can do this as well. They all induce the IgE antibodies. In Australia and Europe, we know they induce the meat allergy. In Africa, we think there are ticks that induce the IgE response, but the amount of clinical reaction appears to be limited – so far, most of it appears to be itching rather than hives or anaphylaxis. Q. Are children any more or less susceptible to the allergy than adults? A. It definitely occurs in children. We’ve seen about 45 cases of it in children in our clinic and if they get tick bites, they can get it. It’s possible that children don’t get it as much, but we don’t have any hard evidence to prove that right now. Anecdotally, we know it’s much more common in our adult allergy clinic. Q. What are the next steps in your research? A. We’re running comparisons with another form of food allergy called eosinophilic esophagitis, because the immune response in that is completely different from the immune response to alpha-gal. Eosinophilic esophagitis is an immune response brought on through the esophagus, so it’s a localized response. We want to understand how that’s different from the alpha-gal immune response that is a non-local, skin reaction. By understanding these different responses, we can learn more about how the alpha-gal allergy is brought on by the initial tick bite on the skin. The header photo is published under creative commons and has been cropped and recolored.